That puts Sanders on markedly different footing than during his first White House run, creating new challenges for a candidate whose supporters relish his role as an underdog and an outsider. He now carries the weight of high expectations and will face heightened scrutiny over everything from the cost and feasibility of his government-funded policy proposals to his tax returns, which he has not yet released. He initially blamed “mechanical issues” for the delay, and his campaign now says he wants to wait until after the April 15 tax filing deadline to fulfill his promise to release a decade worth of returns. Still, Sanders’ message and style hasn’t changed from 2016, when he stunned many Democrats by mounting a formidable challenge to Hillary Clinton and besting her in more than 20 primary contests. After briefly acquiescing to his advisers’ suggestions that he reveal more about his upbringing and personal history, Sanders has returned to his comfort zone: delivering lengthy campaign speeches chockablock with the same policy prescriptions he campaigned on during the 2016 campaign. In Davenport, Iowa, on Friday night, Sanders spent 63 minutes outlining his views on health care, criminal justice reform and economic inequality. “With your help, we are going to complete what we started here,” Sanders told the 1,200-person crowd, referring to his virtual tie with Clinton in the 2016 Iowa caucuses. Sanders’ approach underscores his belief that his success in 2016 was not a fluke or simply a function of being the next best alternative to Clinton. His advisers argue the populist economic message Sanders has espoused for years, often in obscurity, has now been embraced not only by a slew of his Democratic rivals, but also Trump. Despite his strong launch, Sanders’ current standing atop the Democratic field is not entirely enviable. Presidential primaries are long and turbulent, and past elections underscore how many early front-runners have been tossed aside before the first votes are cast. Former Vice President Joe Biden has signaled his expected presidential campaign would serve as a centrist check on Sanders’ brand of progressive politics. And though Sanders’ $18 million first-quarter fundraising haul far outpaced the rest of the Democratic field, some rival campaigns breathed a sigh of relief, having anticipated the Vermont senator would clear $20 million or more. “He did very well. He could have done better,” said Mo Elleithee, who advised Hillary Clinton’s 2008 presidential campaign and now runs the Georgetown University Institute of Politics and Public Service. Chief among them will be bolstering his standing with black voters, one of the most important constituencies in Democratic politics. Black voters overwhelmingly sided with Clinton in 2016, halting Sanders’ momentum when the contest moved into more diverse states. He lost the South Carolina primary by a staggering 48 points. Some of Sanders’ top advisers dismiss the notion that he’ll face similar problems in 2020, noting that he has spent time building relationships with black leaders in South Carolina and other Southern states. He’s also sharpened his campaign message on criminal justice issues and racial inequality. Perhaps Sanders’ biggest challenge is overcoming skepticism among voters who may be partial to his focus on economic inequality but fear that nominating a 77-year-old self-described democratic socialist would put Democrats in a weak position against Trump in the general election. 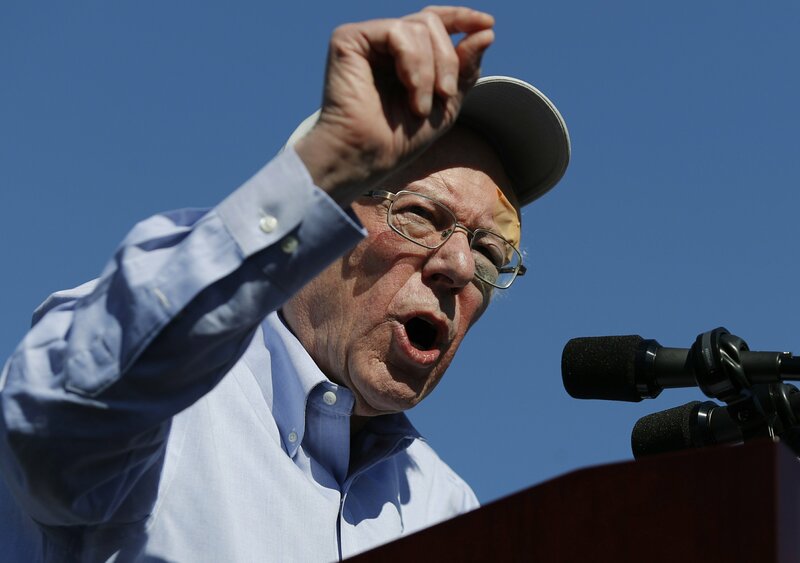 “That’s a thing that scares me about him,” said Gwen Hobson, a 70-year-old Democratic voter, who attended Sanders’ rally on Friday in Davenport. “I’ve been waiting for Bernie,” she said.